If you want an easy recipe for tasty chicken breasts, try this Instant Pot Creamy Lemon Chicken. Flavored with lots of lemon and garlic, with the added earthiness of mushrooms, all in a creamy gravy. 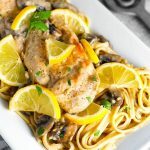 This Instant Pot Creamy Lemon Chicken can be served over pasta, rice, or mashed potatoes. Paul has been under the weather, so his days off have been spent in bed with Netflix! He had just painted the kitchen and family room, so he was pretty worn out. Of course I’ve been taking care of him, and making him tasty food to eat. He wasn’t too ill to eat a good meal, so I thought this Instant Pot Creamy Lemon Chicken would be a nice dinner for him. It’s not a heavy meal, even though it has some cream in it. The lemon balances it out nicely. 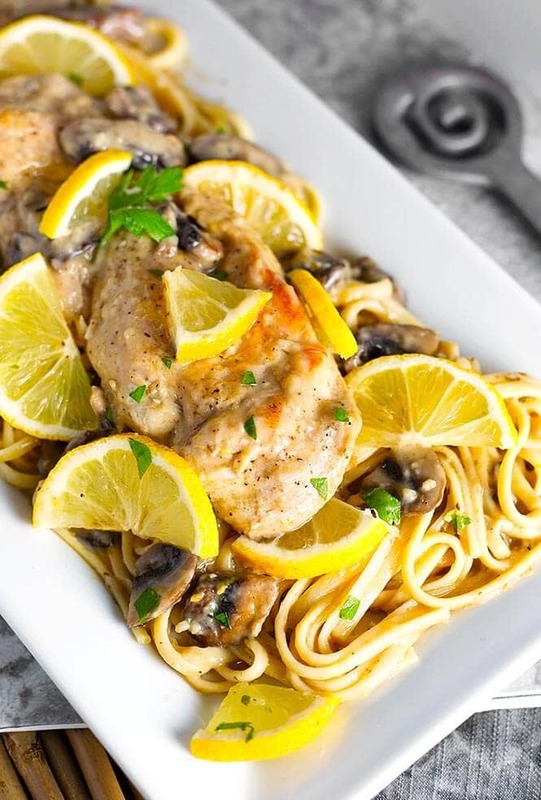 My favorite way to enjoy this lemon chicken dish is over linguine. Bryen likes it over mashed potatoes, so when I cook this and he’s home, I dice up a couple of potatoes and toss them in to cook with it. Then fish them out and mash them up for him. Easy! Instant Pot Creamy Lemon Chicken. Flavored with lots of lemon and garlic, with the added earthiness of mushrooms, all in a creamy gravy. 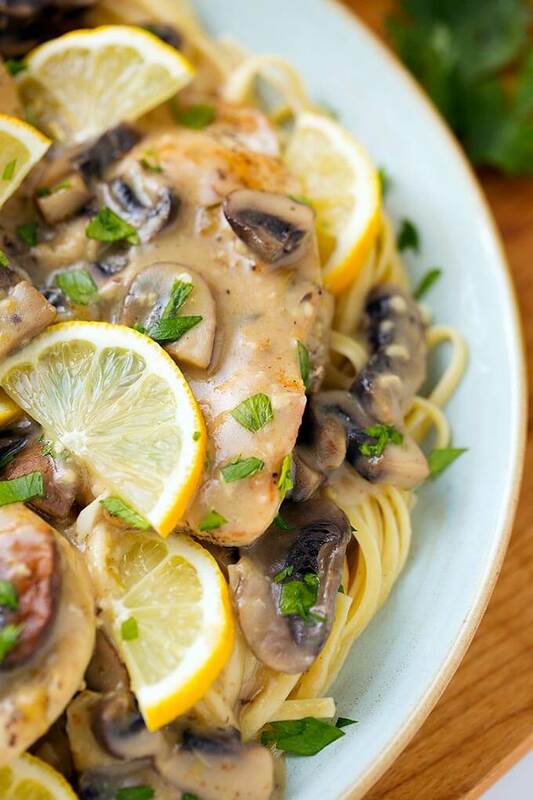 This Instant Pot Creamy Lemon Chicken can be served over pasta, rice, or mashed potatoes. Prepare the chicken by slicing each breast in half lengthwise to make 4 thin breasts (butterflying without remaining attached). Season both sides of each breast with salt and pepper. Turn the pot on Sauté mode. When the display reads "Hot" add 1 Tbsp of olive oil, then the chicken. You may need to brown the chicken in two batches. Cook chicken for 2 minutes per side, then remove to a plate. Add the remaining Tbsp of olive oil and the butter to the pot. Add the mushrooms, garlic, lemon zest, thyme, and oregano. Cook for 1 minute, stirring constantly. Let cook for a few seconds, stirring, then add the broth, lemon juice, and salt. Stir well. Place the chicken on the mushroom mixture and close the lid, locking it in place. Set the steam release knob to the Sealing position. Press the Manual (or Pressure Cook) button and then the + or - button to choose 5 minutes. When cook cycle ends, let the pot naturally release pressure for 7 minutes. Then manually release the remaining pressure by turning the steam release knob to Venting. When the pin in the lid drops, open the lid and using tongs, remove the chicken to a plate and cover with foil. Turn the Sauté mode on again. Mix the butter and flour together and microwave for 15 seconds. Then mix it well and get lumps out, and stir into the sauce. Stir the sauce as it thickens. Turn off the Sauté mode and stir in the heavy cream. I’m making this as I write.. unfortunately as the Pot was getting up to pressure “burn” came on the screen. I depressurized and looked in the pot and bottom is burned. I was wondering if this is due to the flour.. maybe this should be added after in sauté mode.? The sauce was pretty thick before starting…I looked back and added the correct amount of broth, lemon juice and flour… hmmmm?? Hi Katie, I think you are right. I’m able to get it to pressure without burning, but maybe this won’t be true for everyone. So yes, thickening after might be best. I’ll make a note of that for the recipe card. Thank you very much for your feedback!